As we move deeper and deeper into the dreary, gray months of winter it’s always nice to showcase a cheery and bright wedding cake. Take this lovely rainbow cake. 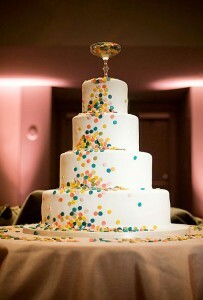 I love the elegant yet whimsical take on using rainbow colors to decorate the cake. The cascade of rainbow candy from the champagne glass is so much fun. Who needs a champagne fountain when you can have a candy fountain? This lovely cake would be great any time of year but it would really brighten up a winter wedding. Of course you could always use different candy colors – or just one color for a more dramatic look. This fun and simple yet elegant cake will leave your guests speechless. You can find this cake here. It was created by Cake Divas.